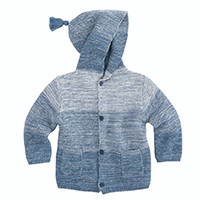 Nothing says fun quite like an Elegant Baby Indigo Ombré Tassel Knit Sweater. Featuring a gradation of colors from light to dark with a festive tassel on the hood, these sweaters are 100% cotton, giving little ones ultimate warmth, stretch and comfort. Presented on a matching padded hanger. Available in sizes 0-12 Months. Complete the outfit and make the perfect gift set with Elegant Baby My First Jeans For Boys or Girls. Makes the perfect gift set for any occasion!